Low-code / No-code Web Application Builder, since 2001. No coding is required: you start from an Excel file or from a database (MySQL, PostgreSQL, SQLite) and the CRUD generator creates for you a basic CRUD (Create, Read, Update, Delete) database front-end in minutes or, through a visual interface configurator, you can create a more sophisticated Web database application. DaDaBIK was added by eugenio in Dec 2010 and the latest update was made in Oct 2018. The list of alternatives was updated Apr 2018 There is a history of all activites on DaDaBIK in our Activity Log. It's possible to update the information on DaDaBIK or report it as discontinued, duplicated or spam. 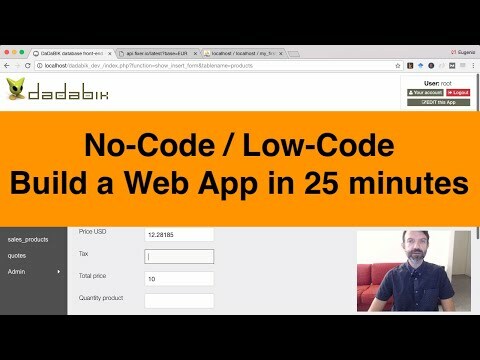 Alternatives to DaDaBIK for Web, Windows, Mac, Linux, Android and more. Filter by license to discover only free or Open Source alternatives. This list contains a total of 25+ apps similar to DaDaBIK. No reviews yet for DaDaBIK, want to be first? Maybe you want to be the first to submit a comment about DaDaBIK? Just click the button up to your right!